For your first oil painting exercise, you’ll follow along with Beginner’s School instructor Cynda Valle as you paint a still life of a glass heart! We expect that each part of this four-part lesson will take a beginning student about two to three hours to complete, though this may vary from student to student depending on your individual pace. Take your time, don’t rush, and if you need to stop you can. If you have more than an hour to spare, then work as long as you feel comfortable! We recommend you watch the video completely for the part you are working on all the way through once without painting, then follow along the second time you watch. It’s also helpful to read our text all the way through before you try to paint along. To make the video full screen, click the box in the lower right-hand corner. Right click on the picture to save it, then print it (if you have access to a printer) or put it on a computer or tablet for handy reference as you’re painting. If this video is too long for you to finish it all in one day, we suggest pausing at 10:10 then coming back to the remainder when you have time. Don’t worry, we’ll remind you in the video also. Cynda begins by recommending using a tablet for reference instead of a printed photograph. While this is really a great method, we don’t expect you to run out and buy a tablet just for this course. If you already have one, great! Use it. You’ll save trees and printer ink by using your tablet, plus it’s easier to zoom in to small spots that are difficult to see otherwise. If you don’t have a tablet, don’t worry–just use a printed image of the reference photo. Cynda has a piece of primed, unstretched canvas taped to a board. Some painters like to work this way and it’s totally fine! What she does is paint on the flat piece of canvas then she will stretch it onto support bars later–this way, she can crop it any way she likes. You’re welcome to try this method if you like, but since our Recommendation List has pre-stretched canvases on it, it’s likely you’ll be using one of those. Don’t worry–it’s the same painting process! Cynda likes to keep a piece of paper or spare gessoed canvas next to her work station so that she can test colors before she puts them on her canvas. You may want to try this method or you may want to be bold and put your colors directly on your canvas. Either way is fine–it’s up to your personal preference. She’s going to start painting with a stiff bristle filbert shaped brush. The first step is toning the canvas, which we discussed in the previous lesson, Ready To Start Painting. 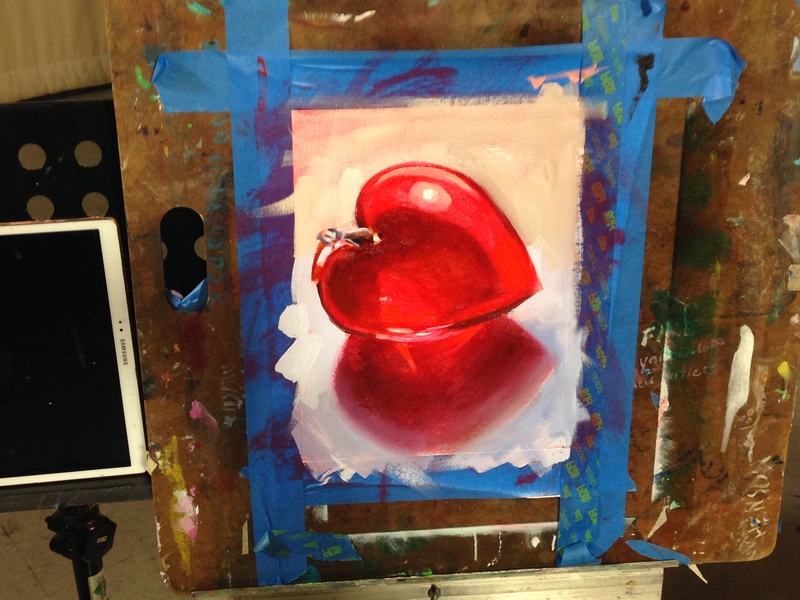 Cynda is toning her canvas with the brightest red that she sees in the photo of the heart. She’s mixing this color from Cadmium Red Light and Quinacridone Red. As she says in the video, you’re just making your best guess when it comes to mixing. Mix the red with your brush and then hold the brush up to your reference photo and see if it looks similar. If it’s too bright, add more Quinacridone Red. If it’s too purple, add more Cadmium Red Light. Once you have the right color mixed (it doesn’t have to be perfect), start brushing it onto your canvas using the largest brush you own for this step. Once you’ve done that, you’ll wipe it with a paper towel to even out the color and make it dry enough to paint on in the next step. Don’t wipe too much of the paint off–you’ll pull off too much of the pigment if you wipe too vigorously! Just a gentle rub will do. Now, Cynda is going to start blocking in the painting. Squint your eyes at your reference photo and try to see the lightest colors. Using a paper towel, remove more of your red background where those lighter areas occur. This will bring your heart drawing back into focus if you lost some of your pencil lines during the first step. If you’re having trouble wiping off the paint, dip just a tiny bit of your paper towel into your Gamsol and use that to pull out the lighter areas. The Gamsol will remove more paint than just a dry towel. I’m sure you’ve seen this image or something similar before. 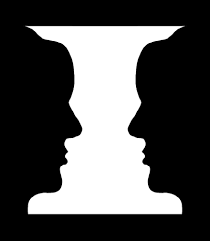 You can either see two faces looking at each other in profile, or you see a strangely shaped white vase. If you were trying to draw this image as two faces, you might get too caught up in “what a face looks like” to accurately draw them. If instead, you focus on drawing this ornate vase, you will have much better success and when you get through with your drawing, you’ll realize you have two perfectly shaped faces (when you didn’t even realize you were drawing them!). It sounds strange, I know, but trust me–it’s worth refocusing your eyes and looking at the negative space in order to create a correct positive shape. Okay, back to the painting. Cynda reminds us that we should keep our brushes clean throughout the painting process so as not to muddy any colors. To clean your brush, first wipe off excess paint on to a rag or paper towel. After that, wash it off in your Gamsol. If you skip the step of wiping off your paint onto a rag, your Gamsol will become quite polluted and that can affect the painting (dirty Gamsol = dirty paint). Remember that your Gamsol (or other solvent) should be in a non-plastic lidded container. You can keep the lid off while you paint, but replace it when you’re finished for the day to avoid spillage and evaporation. Now we’re going to find the dark parts of the painting. You should paint dark to light because it’s easy to make something light again, but almost impossible to get something very dark once you’ve already added white. To find the darkest parts of the painting, squint your eyes and look at your reference photo. The first dark area that Cynda is going to paint is in the center of the heart. To mix the correct paint color, Cynda says she’s going to take “a wild stab at it”. Mixing colors is difficult, and there’s no set formula for mixing the perfect color! It takes practice and patience. Even Cynda, a professional oil painter, is still not sure exactly how to mix a certain color for her painting right at the beginning. She has to work at it. For the shadow in the heart, she’s mixing a little Ultramarine Blue with more of her Transparent Red Earth. Again, she’s holding her paintbrush up to her reference image before she starts painting to test the mixture. As she says in the video, the great thing about oil painting is that it’s done in layers, so if the first layer isn’t exactly right, you can always fix it later on down the road when you add more layers to your painting. Remember the “fat over lean” rule in these beginning stages of the painting. You don’t want to add too much of your medium right now because that makes your paint “fat”. You want to use very little medium at this stage–just enough so that the paint glides smoothly and doesn’t look rough. It’s also good, as Cynda points out, to hold your brush in the “overhand” technique we discussed in Oil Paintbrushes. You want your brush strokes to be loose at this point, so it’s best to hold the brush this way as opposed to the way you hold a pencil, which is very structured and tight. Cynda likes to blend her paints with her finger. You can do this is you like, just make sure to wash your hands before eating. Soap and water are sufficient to clean your hands–you don’t need to use Gamsol or another solvent. If you don’t want to use your fingers, use a dry, clean brush to blend your colors. After Cynda has painted in and blended her shadow on the inside of the heart, she mixes up a cooler color to use for the shadows around the edges. She does this by adding more Ultramarine Blue to her previous shadow color mix of Transparent Red Earth and Ultramarine Blue. 1) if a certain color fits in your painting, it’s more than likely that there will be another part of your painting where the exact same color will work. 2) it is also true that if you use the same color too many times, none of the times you use it will look right. When you’re choosing your paint colors, you want to use the same color in multiple parts of the painting in order to create harmony and balance in your painting. At the same time, you don’t want to use the same color everywhere because over-using a color will make your painting appear flat. Try to find two or three places to use a certain color–after that, change it up a little to keep your painting looking fresh and vibrant. While you’re using this dark blue color for the edges of the heart, look for it in other places–for instance, Cynda finds it in the metal piece at the top of the heart. If you make a mistake and smudge your paint, as Cynda does accidentally, you can use a Q-tip dipped in a bit of Gamsol to fix your error. Note that q-tips might leave a bit of fuzzy material behind, stuck in your paint. To avoid the possibility of that happening, you could also use a clean, dry brush to fix your mistake. Clean your brushes and get ready for the next step in this painting tutorial! Cynda begins this video by adding in the deep red color on the bottom edge of the heart. Using her Quinacridone Red and after testing to make sure it’s transparent, she lays it in with one long brushstroke. Note that the use of the word “transparent” here means that you can see partially through the paint. Paint comes in either transparent, semi-transparent, or opaque colors, so painters don’t really use the term “translucent” to describe paint, even if it is slightly more correct. The idea is that if you painted on a piece of glass, light would come through the paint. We’re not painting on glass, though–we’re painting on canvas, which blocks the light from the other side making the paint technically translucent. In painting terms, however, we just refer to this as transparent. Then she moves to the shadow that the heart is casting onto the table. 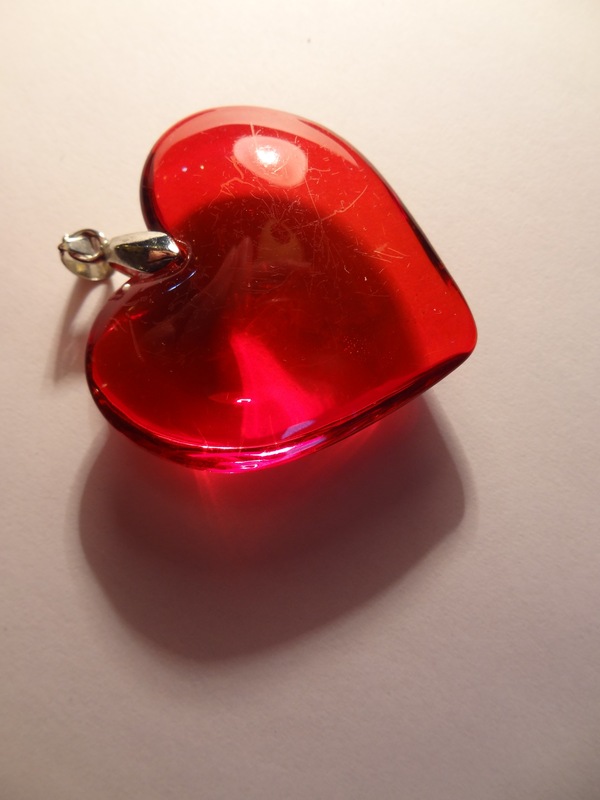 Now because the heart is made of glass and therefore transparent, the shadow isn’t solid, but also transparent. It also has a lot of color in it being reflected from the heart. At the part of the shadow that’s closest to the heart itself, there’s a lot of red, so Cynda is using that same Quinacridone Red to paint in this part. In the darker part of the shadow, it looks like there is some purple-blue, so Cynda mixes up some Quinacridone Red and Manganese Blue. At this point, she thinks the paint looks too brown, so she adds some of her previous purple mixture into the new one to try and get closer to what she’s seeing in the shadow. She notes that generally speaking, you want to mix as few colors as possible for your glazes so they stay nice and bright and transparent. If you end up mixing too many colors into what she calls “a kitchen sink color” (meaning you’ve thrown everything into it but the kitchen sink), it will be muddy and you should probably start over and try to use fewer colors to achieve the one you’re looking for. Once you have the color you want, go ahead and just scrub it in. This should be nice and loose–don’t try to make it all perfect yet. The great thing with oils is that they stay wet for a long time, so you’ll have the opportunity to smooth this out in a little bit. When you do start to blend these colors, you may either use your finger (as Cynda does) or you may use a soft, dry brush. If you do use your finger, don’t forget to wipe it off occasionally so you don’t accidentally get the wrong color! The same advice goes for the dry brush–wipe all the pigment off onto your rag and wash it off in your solvent if necessary then dry it very well before using it again. As I have said before, the great thing about oils is their long drying time. Cynda realizes she’s painted a spot dark when it fact it’s pretty light. Instead of adding white on top of it (which will dull your colors and turn the deep red into a soft pink), she’s using a q-tip to pull the paint out of the bright area. If the dry q-tip isn’t pulling off enough pigment, you can always dip the end of the q-tip into your Gamsol and try again to take some of the paint off your canvas in the lighter area. Blend your edges while the paint is still wet because once it’s dry, you will have lost your opportunity for nice, soft edges. Now Cynda is moving on to the next color, which is a violet with more blue in it so she mixes Quinacridone Red and Manganese Blue Hue. She then adds this color to the outside of the shadow. Again, she’s painting very loosely and sort of scrubbing the color in before she blends it with her finger. She also gets our her q-tips again to pull out more highlights as she continues painting. Towards the end of the video, Cynda mentions that sometimes she needs to brace her hand in order to keep her paintbrush steady. If you need to do this too, you can use your non-dominant hand or a mahlstick (see the lesson Oil Palettes for a discussion of mahlsticks if you need it). Sometimes you’ll notice as you’re painting that you haven’t gotten a certain part dark enough. When working wet-into-wet, the layer on top will not stick to the layer underneath unless the layer of paint on top is thicker than the layer underneath. So at this point you have two options: 1) mix a paint that is slightly thicker than the first layer and apply it to the still-wet first layer or 2) wait for the first layer to dry fully then go back in and add more paint. We’re about halfway finished! Let’s move on to video #3 to find out how to finish our glass heart painting. Again, if you need to stop partway through this video, we suggest doing so at 9:45 (we’ll remind you in the video). Before you start adding in thicker colors in this next step, take a look at your painting and reference photo with one eye closed and the other eye squinted so you can better gauge your lights and darks. If you see any spots that aren’t dark enough, add more dark paint. If you see spots that aren’t bright enough, pull more paint off. Cynda does this and immediately sees some spots that could use some refining. She notices her heart isn’t quite bright enough in a few spots so she’s going to go back in and re-glaze those parts with a mixture of paint and medium. Remember that glazing occurs with wet paint over dry paint, so it’s good to work on several paintings at once. Also, the more layers of paint you add to your painting, the more vibrant it will be. You don’t want to add Titanium White to your glazes because 1) it is opaque (defeating the purpose of glazing) and 2) it will dull your colors, not make them brighter. It’s best to work with pure pigment to really make your layers vibrant and luminous. It’s critical, Cynda says, when mixing red glazes that there not be any blue paint on your brush. Make sure your brush is clean before you begin this part. Now with her clean brush, she’s mixing her two reds, Quinacridone Red and Cadmium Red Light, together with some of her medium. This bright red get scrubbed onto the heart as well as underneath in the beginning of the shadow area. So now Cynda is looking at the shadow area in the left side of the heart. She notices the red is a bit more neutral there, so she adds a bit of her Permanent Green Light (she says “cad green” in the video but she means Permanent Green Light) to her bright red mixture to tone it down. After she adds that green-red to the left side of the heart, she notices the same color occurs in the dark line between the edge of the heart and the shadow underneath so she adds that color there too. Sitting back, Cynda notices that she has a “drawing problem”. This means that during the course of her painting, she has distorted the heart slightly. This happens sometimes. Just be aware of it and make any changes to the drawing/structure as you notice them. In the shadow area under the heart, there’s a transition from the bright red into the cooler violet area that’s a deep red. Now that the paint underneath has dried, you can add a glaze of your Quinacridone Red over the top of that violet color and it will look like a deeper red. Continue refining your darks in the heart. Don’t be afraid to use your paint–you’ll need to load up your brush more than you think so that your paint is nice and juicy and not anemic or thin looking. You’ll notice that Cynda tends to jump around the painting a lot and doesn’t just paint one part until it’s finished, but keeps moving from one part to the next, painting all parts of the painting at once. This is a good way to paint so that you are using the same colors in multiple parts of the painting to bring more harmony to the overall composition. At the edge of the shadow, she sees a grey-lavender color. She mixes this color by starting with Transparent Red Earth and adds some Manganese Blue Hue to it. This is her “wild stab” she says, and she can tell already that the color is wrong, but she’s going to try it to figure out exactly how it’s wrong so she can fix it. She realizes it’s not purple enough, so she adds her cool red, the Quinacridone Red, to her mix and tries it again. It looks okay to her, so she tries it on the canvas. It’s a bit dark, but she will thin it out so she’s going to leave it for now. Remember, we don’t want to add white to the color in order to make it lighter–it will dull the color and make it look cloudy. Instead, she will make it lighter by taking up some of the pigment with her finger. Cynda has also moved on to the middle layers of her painting, so she’s no longer using Gamsol, but straight medium mixed with her paint in order to keep these layers more “fat” than “lean”. Now it’s time to move on to the next step–adding thicker paint and lighter values to the painting. Cynda is switching from her filbert brush (rounded on the end) to her flat or bright brush (square on the end) for the highlights. Again, close one eye and squint the other to find the most important highlights–those that stand out the most. Cynda begins with the background where she notices that the background color is lighter at the top–more of a yellowish-white–while the color near the bottom of the canvas is more of a purple-white. Mixing first the purple-white, she starts with a large puddle of Titanium White then adds a touch of Ultramarine Blue with just a touch of Quinacridone Red. She mentions that you usually can’t make more than one or two brushstrokes before needing to refill your brush with paint. This is a common beginner’s mistake and can cause your upper layers to mix in too much with the lower layers, so make sure to refill your brush often with more paint. This is the first opaque color that we’re using in this painting, which has the effect of creating a nice contrast against the other parts of the painting (which use transparent paint layers). Cynda says that she tends to paint pretty thinly, meaning that her layers of paint are fairly smooth and don’t stand off the canvas much. If you go to a museum and see some of van Gogh’s work, you’ll notice that his paint is almost three-dimensional because he was painting very thickly. We talked about this method, known as impasto, in Oil Painting Methods And Techniques. Every painter has their own way of doing things and both of these methods are totally acceptable–it just depends on how you feel comfortable applying the paint. Don’t be afraid to use your big brush even in small areas–by turning the brush sideways, you can use the edges to get into tiny spots you may otherwise think require a very small brush. Once the background is painted in around the shadow, Cynda blends the shadow into the background to make a nice, soft edge between the deep purple shadow and the light purple-white background. She continues to refine parts of the heart before moving on to the final stage and completing the painting. If you need to pause, 11:15 is a good place to do so. We’ll remind you in the video just in case. Now that Cynda has added in the background color underneath the heart, she’s going to move on to the highlights within the heart itself. She’s going to use a smaller flat brush and she’s making a small puddle of Titanium White with just a touch of Cadmium Red Light. A quick note: Cynda says in the video “a touch of cad orange light” but what she meant to say was “cad red light”. Don’t be confused! It was just an error in speech. You can see in the video that she’s pretty bold when adding these highlights in, and you should be too! The strong contrast is what will make it look truly like a shiny piece of glass. Even though she gets a bit enthusiastic with her highlight on the top part of the heart, she is easily able to wipe it off because it’s oil paint and it’s still wet. Remember earlier when we were scrubbing in the paint? Yeah, that was fun. DON’T do that now. Now that we’re putting in the top layers of paint, we should be using thicker paint and bolder brushstrokes. If you start scrubbing at this point, you’ll mix in all your other layers underneath with what’s supposed to be on top. Now with these very definite highlights, just lay the paint in thickly with confident marks and don’t try to scrub it in or blend it–that is called “licking”. “Licking” with your paintbrush will end up in your paint becoming a middle value (instead of a definite dark or light) and it will only dull down your painting. Use much more paint than you think you need–don’t be afraid of using your paint! To brighten some of her highlights, Cynda is going in with an opaque pure Cadmium Red Light. For the brightest white highlight on the top of the heart, Cynda is using pure Titanium White. Because the paint underneath that spot is still wet, you’ll want to load up your brush with a lot of paint and lay it on very gently. In the video, Cynda accidentally “licks” the paint (brushes it too much) and it picks up some of the red from underneath. She gives herself another shot at this highlight–first, she wipes off the dirty paint from the end of her brush, then picks up more Titanium White and just lays it on top of that highlight. It’s not even a stroke, it’s just a gentle laying down of the brush on top of that spot where she wants it to be bright white. That’s it–don’t try to blend it–just leave it where it is! Now she’s going to paint in the top half of the background. This color looks like a warmer white, so she’s mixing a new puddle of white with a touch of yellow to warm it up. When she tests this color, it’s too bright so she neutralizes it a bit with a cooler color. It’s too dark when she paints it onto the canvas, so she picks up some white and paints it in right over the top of her first stroke. After filling in the top part, she goes back to the bottom part and adds a darker purple tone around the shadow. After a bit more refining in the shadow area, Cynda moves on to finishing up her highlights. If you look at her blob of white paint on her palette, it’s pretty dirty since she’s been using it throughout the painting process. In order to get really nice strong highlights, you want pure white. If your white paint looks like hers, squeeze out a bit more from the tube onto your palette so you have a nice clean white to work with. Load up your brush and use thick paint so that your highlights really stand out. Once you’ve done that–you’re finished! How did your painting turn out? Share it with us by sending us a photo using our Submission Form. CONGRATULATIONS PHIL AND ASHLEIGH LOOOKS GREAT!!!!!!!!! Thank you, Cynda! We couldn’t have done it without you!